Today I present three women artists I learned about through Pinterest. Each was immensely talented, independent, eccentric, and strong-willed. Their lives overlapped and I wonder if they were aware of each other. Click the links to learn more about their fascinating lives and see additional examples of their work. 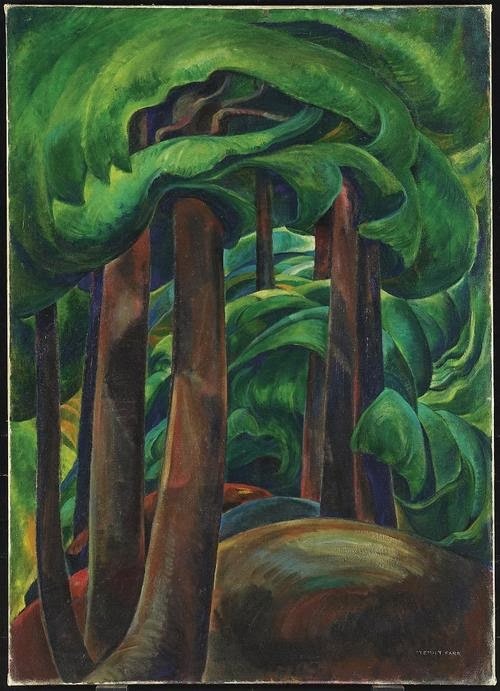 Emily Carr (1871-1945), an iconic Canadian artist and writer, was heavily inspired by the indigenous peoples of the Pacific Northwest Coast. Early work had aboriginal themes especially when she was living and painting on the Queen Charlotte Islands and Skeena River where she documented the Haida, Gitxsan and Tsimshian people. Later she focused on landscapes, especially forests. She was one of the first Canadian artists to adopt a modernist and post-impressionistic style. Carr also wrote six books, three of them published posthumously. As far as I know, she was never married or had children. I laughed when I read this in Wikipedia: "Carr took a teaching position in Vancouver at the 'Ladies Art Club' that she held for no longer than a month--she was unpopular amongst her students due to her rude behavior of smoking and cursing at them cursing at in class, and the students began to boycott her courses." Although she didn't receive much recognition (or respect) during her lifetime, she is now considered a national treasure. Emily Carr University of Art and Design, is located in Vancouver, BC. She who laughs last, laughs best? 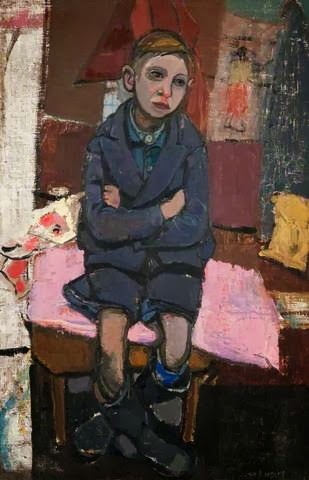 Joan Eardley (1921-1963), born in Sussex to dairy farmers, had a challenging childhood that included her father's post-WWI mental breakdown and ultimate suicide. Placed in the care of a grandmother, her aunt paid for her education at a private school where Eardley's artistic talent was first recognized. Thank goodness. She ultimately moved to Glasgow, Scotland. Her friend Annette Stephen bought her a cottage in the village of Aberdeenshire and that became her home base. Eardley's figurative work often includes text (calls to mind Basquait) and is mostly based on everyday life, often the gritty life of the working class. Poor city children at play and children being cared for by an elder sibling are frequent themes. She loved to work outdoors, often in poor weather, and is best known for bleak and desolate landscapes, including powerful and stormy seascapes. One scholar said she painted the sea "with the perception of a mariner." Other landscapes of fields on sunny days may appear tranquil on the surface but I think they simultaneously reveal an underlying tension that the weather could change at any moment. She died relatively young of breast cancer that had spread to her brain, for which she did not seek treatment. Gabriel Munter (1877-1962) was born into a wealthy family that encouraged her artistic endeavors. Considered a German expressionist at the forefront of the Munich avant-garde in the early 20th century, Munter was well connected to many artists of her era. Although she wasn't allowed to study at the German academies due to her gender, the Russian painter Wassily Kandinsky took her art seriously; they eventually became lovers, but their relationship ended bitterly. With Kandinsky, Munter and several other artists formed Der Blau Reiter (the Blue Rider), an important Expressionist organization. Her work is known for simplified forms and expressive use of color, even though it changed stylistically over time. In addition to painting, she studied woodcut techniques, printmaking, and sculpture. During WWII Munter hid paintings by Kandinsky and other now-prominent painters from the Nazis. 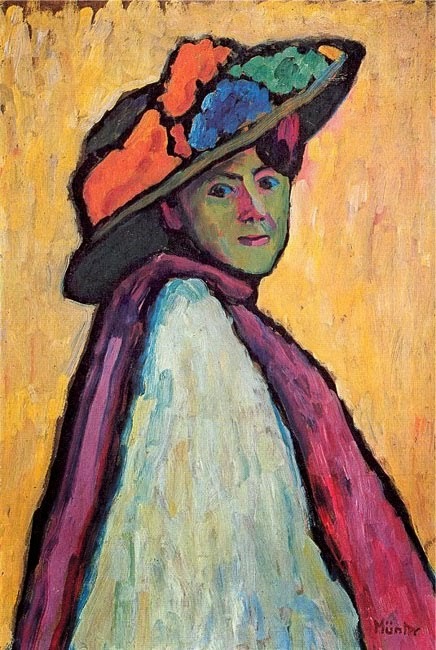 Munter was an unusually independent, self-sufficient, ambitious and accomplished woman for her era, quite unconventional. Her "Portrait of Marianne von Werefkin" is shown to the left. Treasures found while beach combing Pinterest!